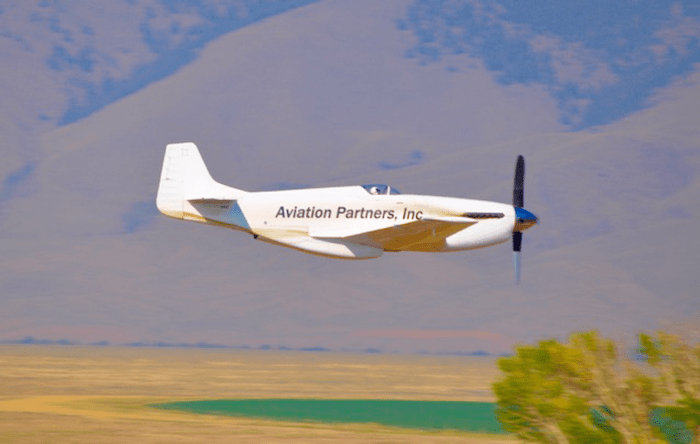 Absolute World Speed Record for Piston Engine Propeller Driven Airplane Set by Steve Hinton Jr. - Aviation Partners, Inc.
Absolute World Speed Record for Piston Engine Propeller Driven Airplane Set by Steve Hinton Jr.
Seattle, WA September 6, 2017: At a remote location in Central Idaho on a private airport on Saturday 09/02/2017 at 5:30PM Steve Hinton became the fastest pilot on the planet ever in a Piston Engine Propeller Airplane. Four laps over a three-kilometer course at an average speed of 531.53/MPH- the fastest lap was 554/MPH in a highly modified P51 Mustang. Aerodynamic wing modifications by Aviation Partners INC. played a key role in achieving the absolute world speed record over the 3-kilometer course. Aviation Partners, known worldwide for its Blended Winglets™ and Split Scimitar™ Winglets, on Business Jets and Commercial Aircraft used highly sophisticated computational fluid dynamics (CFD) methods to redesign the P51’s wing surface airfoils and to reduce and eliminate the strong shock waves created at Mach number 0.75 and 0.80. The modification thereby delayed the drag rise Mach number, allowing the P-51 to achieve higher speeds. My sincere congratulations to Steve Hinton and his amazing crew, API’s dedicated engineers, and Bob Button the owner of Voodoo the highly modified P51 for this remarkable achievement.